6a architects, APPARATA, Rachel Armstrong, Rana Begum, Tatiana Bilbao Estudio, Cao Fei, Mariana Castillo Deball, Cécile B. Evans, Simon Fujiwara, Andrés Jaque/Office of Political Innovation, David Kohn Architects, mono office, Farshid Moussavi Architecture, Hardeep Pandhal, Amalia Pica, Jacolby Satterwhite, Zineb Sedira, and Marina Tabassum Architects. 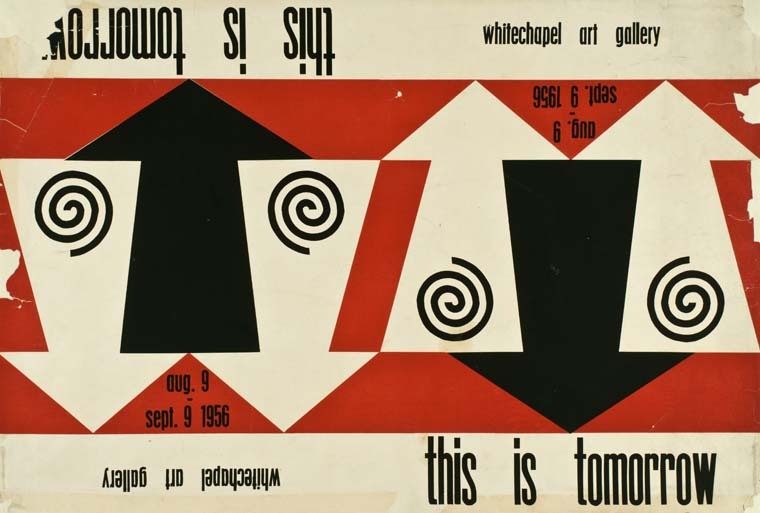 John McHale, poster for This is Tomorrow exhibition, Whitechapel Gallery, August 9–September 9, 1956. Courtesy of Whitechapel Gallery Archive. Modelled after This is Tomorrow (1956), arguably the most influential exhibition in Whitechapel Gallery’s 118-year history, this new presentation brings together architects, artists, and other creative practitioners from around the world to highlight the potential of collaboration, to address key issues we face today and to offer a vision of the future. Taking a cross-disciplinary approach, ten groups, each including at least one architect and one artist, have been commissioned to create environments, structures and displays, incorporating artworks, film, graphics, information, objects, and performance to address important cultural, social, and political questions and issues we face in the 21st century, from economic inequality, migration and resource scarcity, to education, labour, technology, and trade. Lydia Yee is chief curator at Whitechapel Gallery. She has curated recent solo exhibitions by artists including Leonor Antunes, Ulla von Brandenburg, Mary Heilmann, and Keith Sonnier, among others. Previously as curator at Barbican Art Gallery, her exhibitions included Magnificent Obsessions: The Artist as Collector (2015), Bauhaus: Art as Life (2013), and Laurie Anderson, Trisha Brown, Gordon Matta-Clark: Pioneers of the Downtown Scene (2011). Yee was senior curator at the Bronx Museum of the Arts, where she developed a multidisciplinary approach to exhibitions, exploring the intersection of art, film, music, and urbanism. She was also cocurator of British Art Show 8 (2015–16) and is currently curator of Frieze Talks. Trinidad Fombella is an architect and curator. She is currently assistant curator at Whitechapel Gallery, London. Prior to relocating to the UK to complete her MA in the history of art at the Courtauld, she was assistant curator and exhibitions manager at El Museo del Barrio, New York, where she worked since 2007 on several exhibitions with a focus in art from Latin America. These include the largest edition of El Museo’s biennial, The (S)Files (2012), Nexus New York: Latin/American Artists in the Modern Metropolis (2010), and Arte ≠ Vida: Actions by Artists of the Americas, 1960–2000, which toured internationally between 2008–2011. After receiving her architecture qualification at Universidad Catolica de Cordoba, Argentina, in 2002 she joined the exhibition design department at the Solomon Guggenheim Museum, New York. Cameron Foote is assistant curator at Whitechapel Gallery, London. Before that, he held similar positions at Tate St Ives in Cornwall and The Museum of Modern Art and MoMA PS1 in New York. Recent exhibitions he has contributed writing and research to include The London Open (2018), Thomas Ruff (2017), Alicja Kwade: Medium Median (2017), Eduardo Paolozzi (2017), and Yoko Ono: One Woman Show (2015). The Whitechapel Gallery presents modern and contemporary art and ideas to local, national and international audiences and provides a platform for free thinking, creativity and learning. Founded in 1901 to bring great art to the people of the East End, the Gallery has grown in size and impact and now enjoys an international reputation for excellence. Each year the Gallery presents an ambitious program of exhibitions and events over three seasons. This comprises solo shows of mid-career artists, historical surveys, commissions, collection displays, archive exhibitions, film and public events. Our education and community program offers free learning activities to local schools and community groups, helping to inspire the artists of tomorrow. We offer a direct experience of art to around 350,000 people per year. Many of the gallery’s exhibitions reach a still wider audience by touring to major museums and galleries throughout Europe. The Whitechapel Gallery is a registered charity.